Sircuit Addict™+ provides your skin with superior firming and moisturizing properties that help to fight against the ongoing effects of aging skin. Fortified with powerful antioxidants and rich in highly active, age-defying ingredients that help to nourish and protect your skin from free radical damage while also helping to restore your skin’s dewy moisture. This unique blend is also SUPERCHARGED with plant stem cells and L-Carnitine for additional skin support. Instantly your skin will feel firmer and softer and you’ll soon become addicted to the way it makes you look and feel! 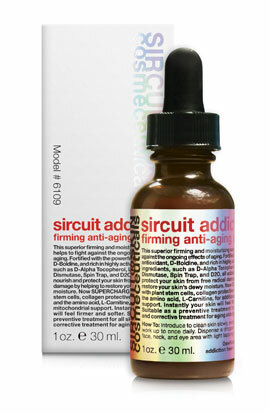 Sircuit Addict™+ is a potent serum that far surpasses any other antioxidant or firming serum on the market today. Bestseller! Dawhling… never has an addiction been so good for you! Provides a powerful combination of antioxidant protection for superior anti-aging benefits. Helps to restore natural radiance, softness and elasticity. Skin Type: Suitable as a preventive treatment for all skin types and as a beneficial treatment for aging skin types. How To: Introduce this product to clean skin slowly, every other night, and work up to once daily. Dispense a small amount to back the back of your hand and apply to the face, neck, and eye area with light tapping motions. For the ultimate treatment, apply after Youth Accelerator™+, Mocha Locha™+, or Sir Activ™+ and follow with Molecular Mist™+ and Dreamweaver™+. Sircuit Addict™+ is a nightly skin firming treatment that will help firm, without tightening, and is the perfect complement to your home treatment program. Shake well before use. Ergothioneine (L): A Chirally Correct, natural antioxidant and amino acid that potentially helps to reduce damage caused by environmental stressors. It is an MMPi and has anti-aging properties which help to minimize the signs of aging such as fine lines, wrinkles and sagging. 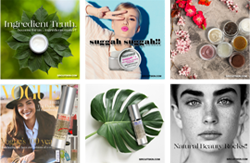 Epigallocatechin Gallate: A protective antioxidant derived from the most potent part of green tea that provides anti-aging benefits and moisturizing properties. Boldine (D): A major antioxidant from the Chilean Boldo Tree with potential calming and soothing properties. Cassia Betaglycan Extract: A soothing and moisturizing ingredient from the Cassia Bark. Grape Seed Oil: An antioxidant-rich in Linoleic Acid, which also acts as an emollient, helping to reinforce the skin’s protective barrier. Superoxide Dismutase (L): A Chiral form of a potent antioxidant with powerful anti-aging properties that are capable of neutralizing free radicals present in the environment. By reducing levels of oxidative stress, it also inadvertently helps to promote skin radiance. Buddleja Stem Cells: An antioxidant that helps to provide soothing protection from oxidative stress and plays a key role in enhancing overall skin quality. Carnosine (L): An amino acid that helps keep skin feeling firm and soft and a super antioxidant that quenches even the most destructive free radicals promoting the appearance of younger, smoother looking skin. Whey Protein: Helps promote skin brightening. Formulated With: Hamamelis Virginiana (Witch Hazel) Water, Glycine Soja (Soybean) Protein, Glycerin, Aqua (Water), Alcohol Denat., Tocopheryl Acetate (D-alpha), Polysorbate 20, Ergothioneine (L), Polygonum Cuspidatum (Giant Knotweed) Extract, Phenyl t-Butylnitrone (Spin Trap), Epigallocatechin Gallate, Camellia Oleifera (Green Tea) Leaf Extract, Peumus Boldus Leaf Extract, Cassia Angustifolia Seed Polysaccharide, Vitis Vinifera (Grape) Seed Extract, Saccharomyces/Xylinum/Black Tea Ferment, Glycine Soja (Soybean) Oil, Macadamia Ternifolia Seed Oil, Lavandula Angustifolia (Lavender) Oil, Rosa Damascena Flower Oil, Jasminum Officinale (Jasmine) Oil, Citrus Aurantium Dulcis (Orange) Peel Oil*, Cananga Odorata (Ylang Ylang) Flower Oil, Citrus Grandis (Grapefruit) Peel Oil, Aleurites Moluccana Seed Oil, Santalum Austrocaledonicum (Sandalwood) Wood Oil, Buddleja Davidii Meristem Cell Culture, Wine Extract, Glutathione (L), Carnosine (L), Carnitine (L), Glucosamine HCI (D), Whey Protein, Superoxide Dismutase, Xanthan Gum, Hydroxyethylcellulose, Citric Acid, Phytic Acid, Potassium Sorbate, Hydroxyethylcellulose. *USDA Certified Organic | NOP. Phthalate-free.